When DH and the kids and I became a family, I was introduced to the concept of popcorn and apples for dinner for Saturday night. I was a slow convert – I like dinner to be dinner. But the kids love it – no pressure to eat anything they don’t like, and it is easy and sort of festive. 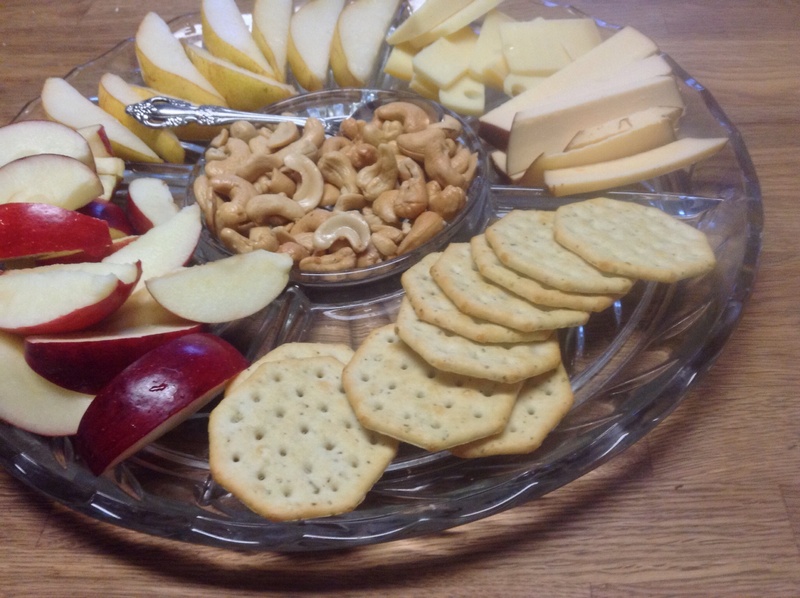 My take on popcorn and apples is Saturday appetizer night (which is sometimes on a Friday). 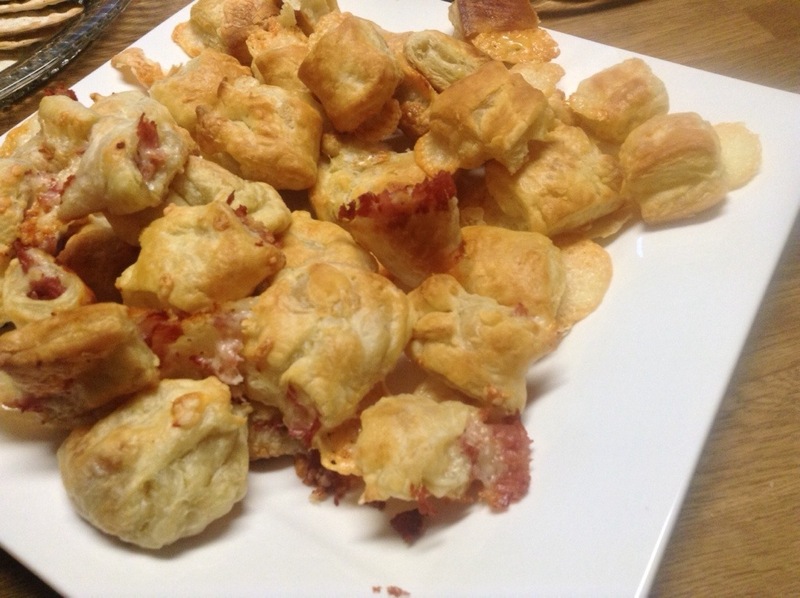 Lots of easy little nibbles. 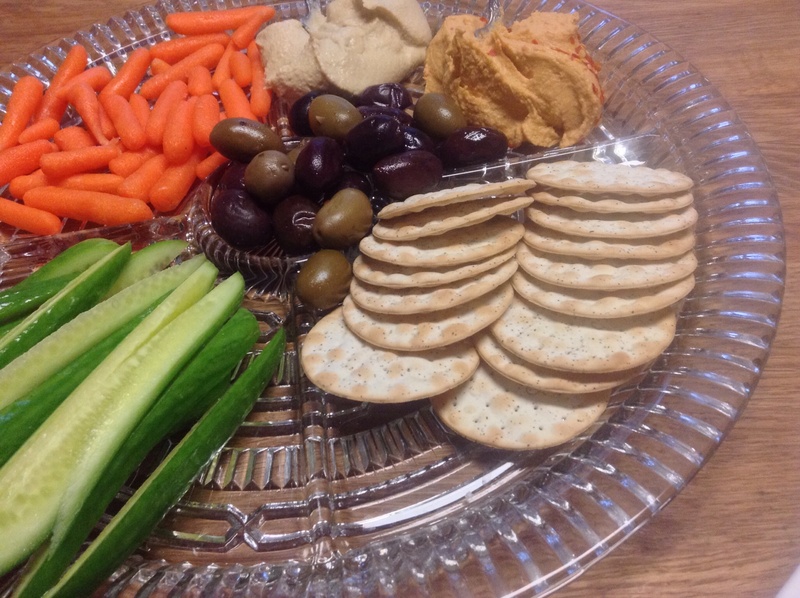 Because I am trying to increase my cooking prowess, when we did this last Saturday night, I added an actual appetizer that was something other than chopping or opening. I made little Croque Monsieur amuse bouche. Almost doesn’t count because it is just putting cheese or cheese and ham into prepared puff pastry and, well, chopping. But they were delicious. This was paired with veggies, pears, apples, hummus, olives, cheese, and crackers. And was a hit. 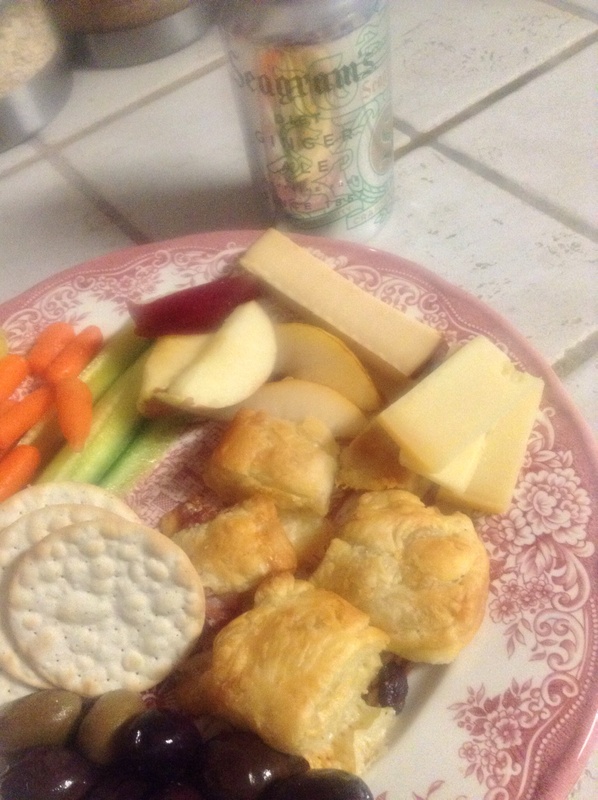 I served myself a heaping plate of appetizer happiness with my favorite low-rent cocktail, diet ginger ale in a can. Klassy. On a Wednesday, I went to The Head And The Heart concert. It was on a Wednesday because it is Kansas City. Big enough to get the good bands, not big enough to get them on the weekend. It is hard for me to go to a concert on a weeknight. I miss sleep, work still marches on. I am a creature who has habits and likes them. But 90% of the time I am glad I go to hear live music, even if it is hard to do so. And last Wednesday was no exception. One of the opening bands was The Belle Brigade and they were mind-blowing. Since then I have downloaded their first album and am doubly in love. Especially with this song. I forget that I can’t do everything. 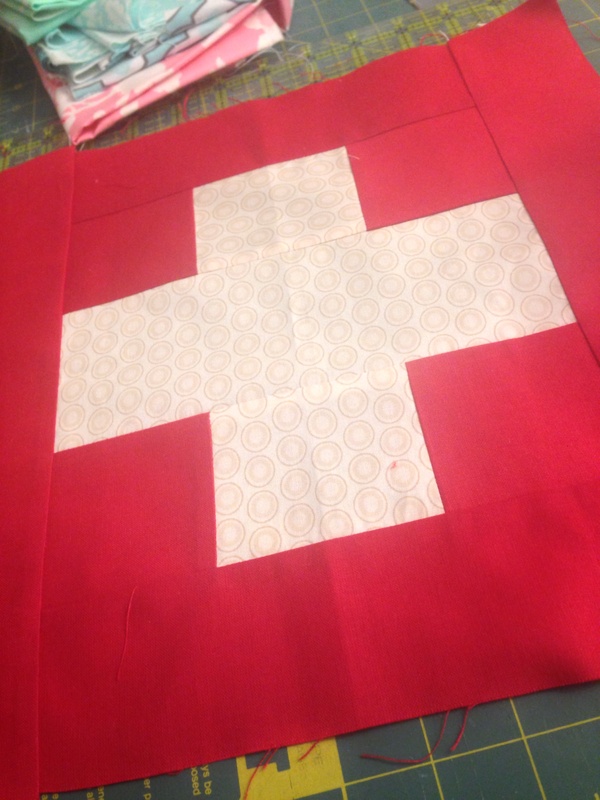 I have been into this quilting thing for almost a year now and I feel like I should be an expert. My skills have gotten so much better, but I am years, possibly decades away from being an expert. A year ago I didn’t know how to thread my bobbin correctly. 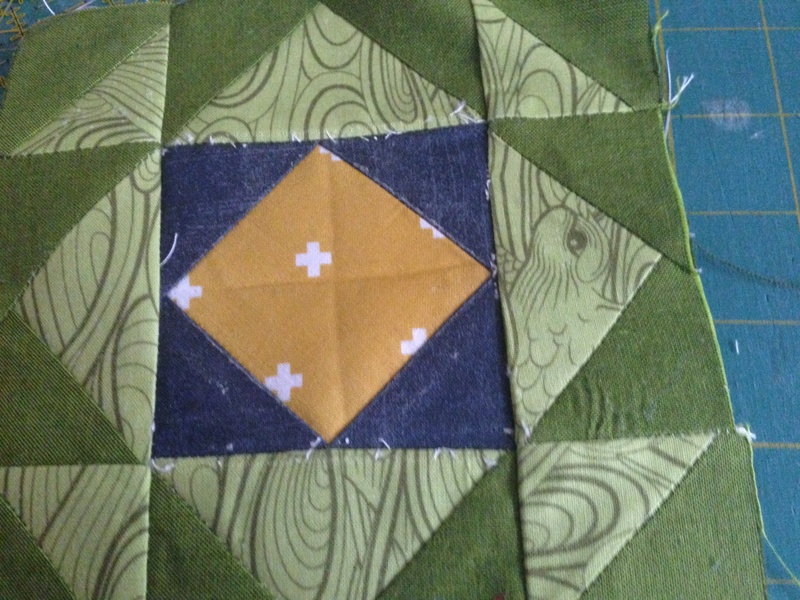 Now I am pretty darn close to competent free motion quilting on my wee machine. A year ago I couldn’t get my mitered corners on my binding to look like anything more than a smush. Now I can do mitered corners even on a machine-sewn binding. A year ago I didn’t know what “HST” stood for. Now I can make HSTs pretty close to the correct finished size and get the points to be pointy. For the most part. The Moda Modern Building Blocks pattern had me at “Hello”. I love the cohesive sampler look right now. I joined a monthly subscription for fabric for four blocks a month. Very difficult. I guess I had heard that sewing on the bias was difficult, but since the main bias sewing I have done was HSTs that were trimmed down to the right size, I didn’t see a problem. Whoa, was I wrong. Three out of the four blocks this month were lots of pointy bias. And the instructions don’t provide a listing of what the finished size of the HSTs or flying geese are supposed to be, and so I didn’t know what I was trimming to. The center of my first block ended up WAY small. So I added a border. And it was adorable. My next block was also way off. So I added a border. And it isn’t adorable. My third block I sought guidance on the internets. I used heavy startch and a lot of wishing and it is only slightly too small. Better, but still not right. Sigh. I can’t do everything. I am still learning. Let me repeat that, for my own benefit. I can’t do everything. I am still learning. There are moments when I am so proud of myself – little private moments at my sewing table – getting a point right, understanding a pattern, nailing a mitered corner. Those moments are wonderful. So I need to make peace with bias piecing and work and wait for my moment when I get it right. 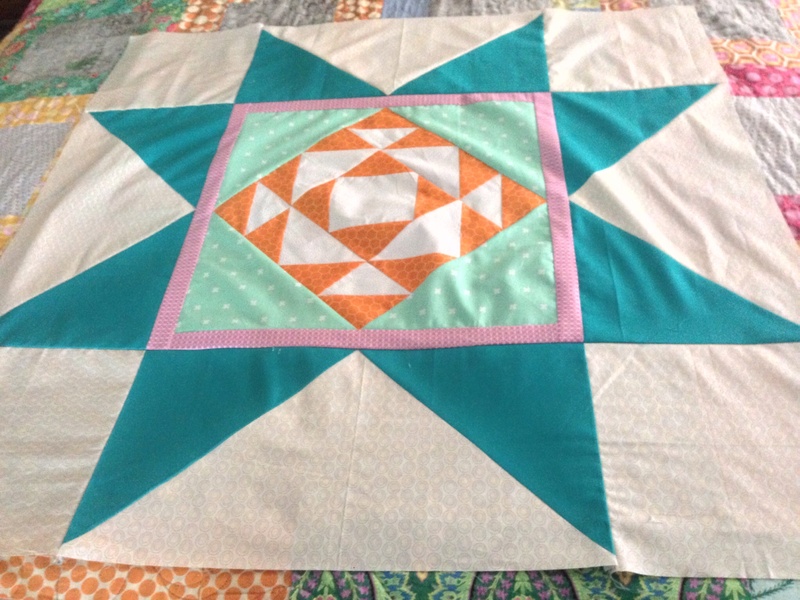 My sampler quilt will most likely have lots of extra borders in the blocks. And that will be ok. Let me repeat that, for my own benefit. It will be ok.
We need valleys for the peaks. 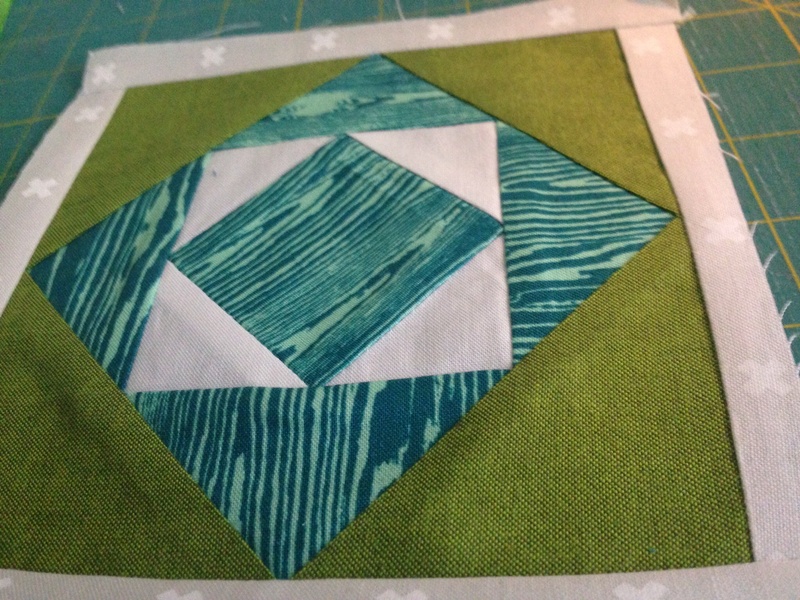 The last block for this month was this little cross – a little reprieve in the biased sewing. And it ended up sized perfectly. A reassuring little win on this quilty journey. A little friend of mine had her first birthday recently. I had some fun making these little bibs for her. 1. I love working with a warm color palette. Keeping it to just red, pink, orange, yellow always ends up with something that really makes me happy. This project has just a soupcon of green – just enough I think. 2. 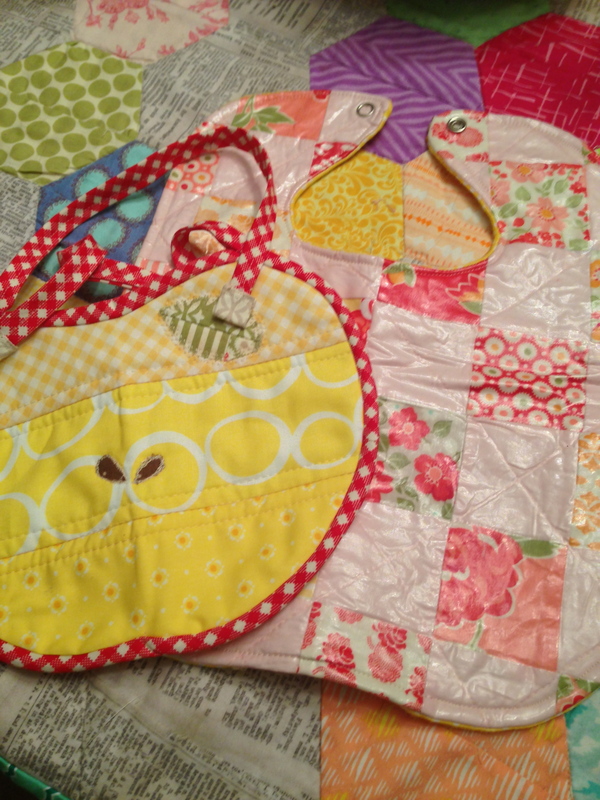 I worked with fusible vinyl – I think a winner for baby bibs, but next time I won’t do a quilted piece underneath. It worked out fine, but would look crisper just with piecing. 3. I admit it. Bonnie and Camille fabrics are the cutest. 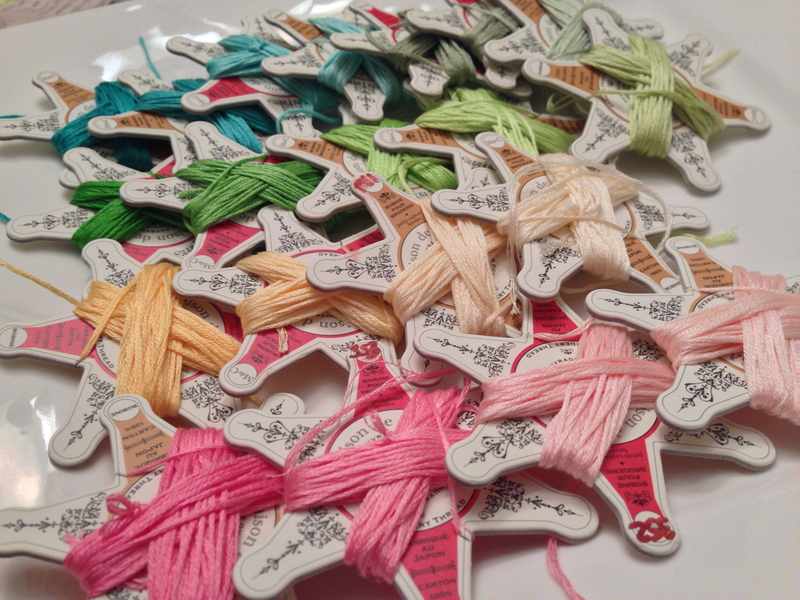 I used up almost the last bit of a mini charm pack for the patchwork bib. 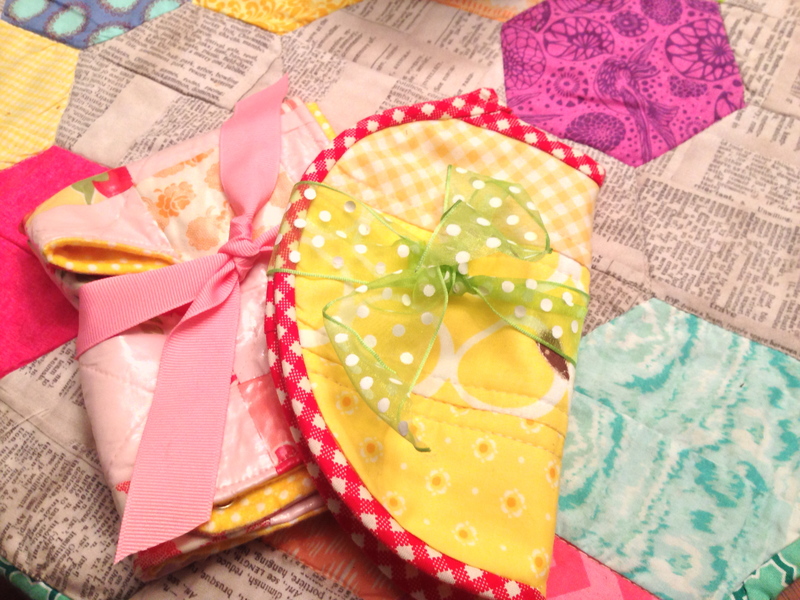 Most of the rest of the charm pack was used in the bright hexagon baby blanket I made for this same little one. 4. 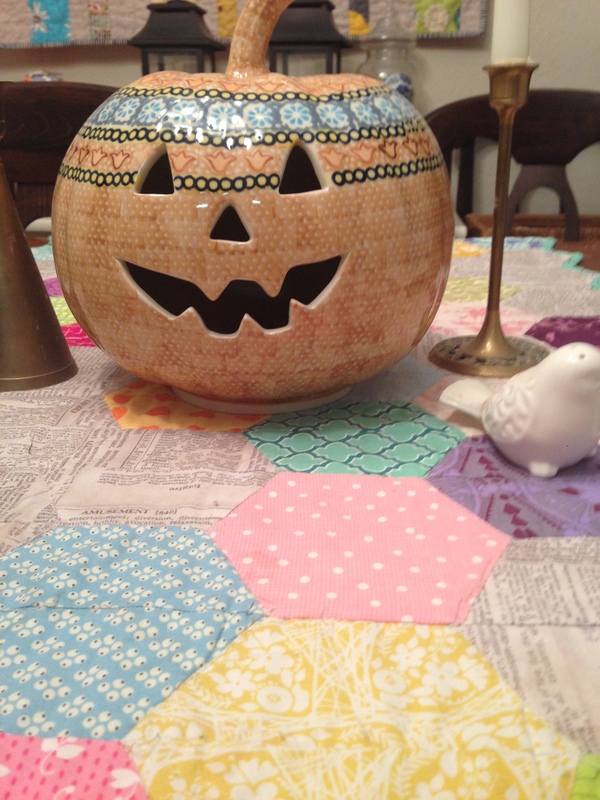 I failed at making this apple bib from Patchwork, Please! about 10 months ago. I nailed it this time. I knew what adjustments to make and how to get the applique to work. win and win. It really is a sweet little pattern. I could make a lot more. 5. I stuck with the warm-colors-with splash-of-green theme and wrapped all of the goodness is some more of the colors. 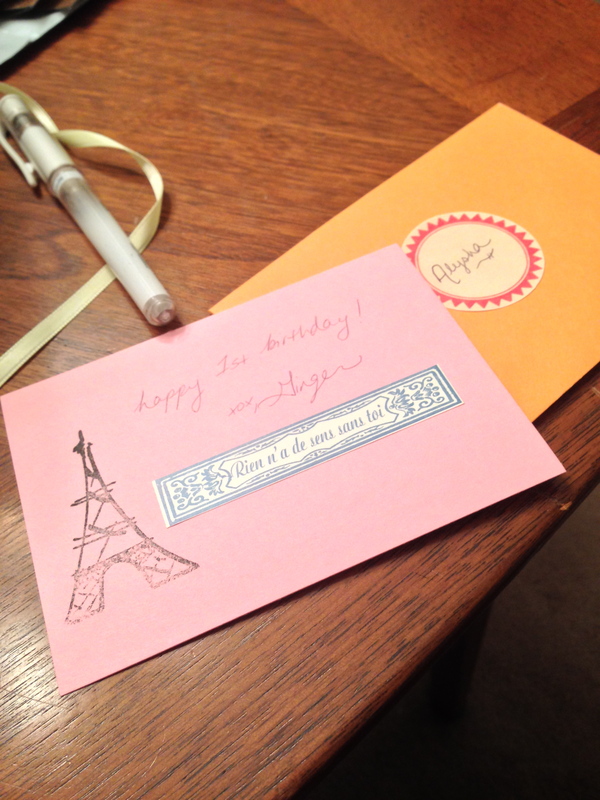 And an Eiffel Tower and French phrase for a little girl who I think will be speaking French someday. I am pretty much a sewing machine sewer. I was doing some English paper piecing to keep my hands busy while watching marathons of anything British with my husband. 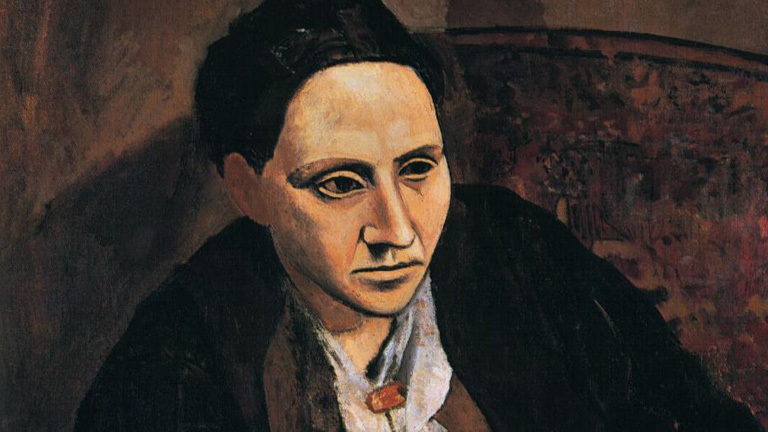 But it would only hold my attention for so long – it feels so fiddly that it isn’t fun at times. And progress is slllllooooowwww. And then I saw a picture on Instagram of someone doing this awesome alphabet cross stitch. And I had to do it. On a whim I bought enough materials to get me started, and the pattern. 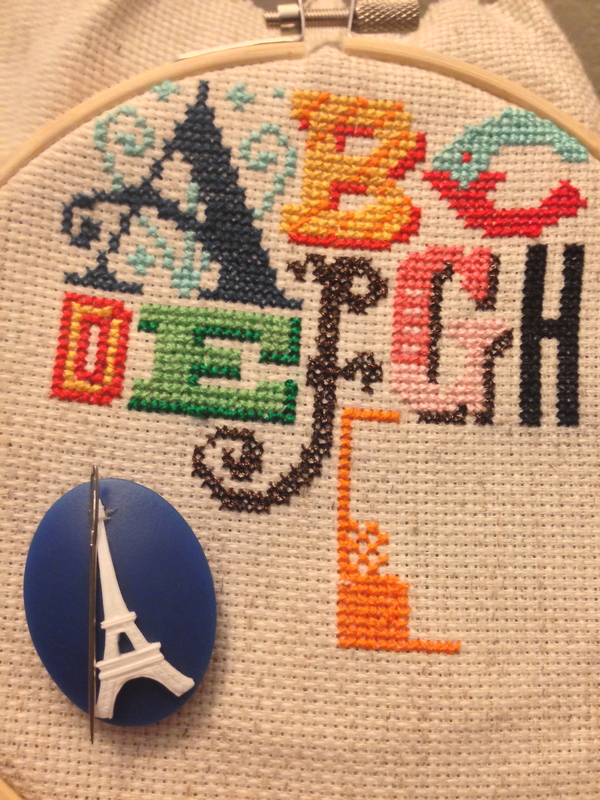 And *maybe* also I bought an Eiffel Tower needle minder. And, well, love, love, love. And so many ADORABLE cross stitch patterns! I am trying to do a letter a day at least – but I find myself looking forward to working on it. Anything that gets me away (willingly) from the sewing machine is a winner. There are a bazillion cross stitch projects I want to do now. But I am REALLY. TRYING. to only take one project at a time. I’ll finish this alphabet and then I really want to do quilty stitches. I have my materials all ready to go for that one.